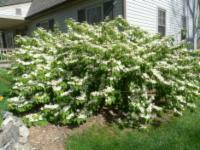 Here's a list of the berry plants and shrubs that we sell. All of our plants do well in Central Virginia (zone 6b-7a), and have been selected to require as little maintenance as possible. Life is just too short to waste time spraying your garden with chemicals! 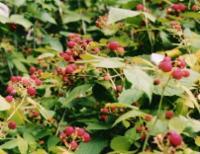 Our berry bushes and vines are all very productive and easy to grow organically. Our ornamental shrubs are fuss-free and beautiful. The plants are sold bare-root, wrapped in wet newspaper and plastic, so plan on planting them within a week of purchase. Due to the heavy and unpredictable customer traffic, plants must be pre-ordered/pre-paid by phone so we can have them ready for you on the day you'd like to pick them up. Transplanting seasons are Spring (late March - mid May) and Fall (late October - early December). Nursery hours are 11:00 AM to 5:00 PM Monday-Saturday, and noon to 5:00 PM on Sunday. We also offer shipping to any location in the state of Virginia; the cost is generally between seven and fifteen dollars per order, depending on weight and size. Thornless Blackberries $3.50 each These totally thornless canes produce large blackberries in the Summer, without the hassle and scratches associated with their smaller wild cousins. 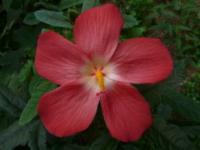 'Triple Crown' and 'Black Satin' varieties are available. Our favorite variety, 'Triple Crown', has large, sweet fruit that is great for eating right off the bush. The canes are very disease-resistant, with a short, trailing habit. 'Black Satin' produces berries that are smaller and not as sweet, but it's more productive than 'Triple Crown'. 'Black Satin' also tends to grow more upright, so it's better if you want tidy bushes that don't need much control. Three different varieties available: 'Heritage', a classic red raspberry which bears in the Spring and Fall and has stubble instead of true thorns; 'Fall Gold', which also has stubbly stems and bears 2 crops per year of sweet yellow berries with a flavor reminiscent of apricots; and a black variety that has one crop in the Summer and thorns, but we love it anyway and can never get enough of the marvelous, tangy fruit that is unique and amazing! 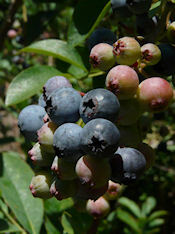 Southern-Variety Blueberries $9.00 Several varieties available, bearing from early July to October. Carefree and easy to grow organically; mature height twelve feet. Bred for southern climates; highly productive, despite heat and drought. 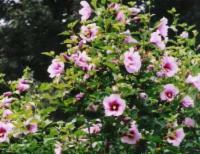 Amazingly resistant to practically everything, and largely unaffected by Japanese beetles. Plant at least two different cultivars for proper cross-polination and an extended harvest season (we harvest about 20 pounds of large berries off of each plant!). Blueberries also make good landscaping plants, as they are very ornamental. They have four seasons of interest: white, bell-shaped flowers in Spring, berries in Summer, bright red leaves in Fall, and exfoliating bark in Winter. Concord Grape Vines $8.00 each Best grape we've found for our area; the only one we are able to grow organically. Concords are strong-tasting and make wonderful juice and jam, but many people enjoy eating them fresh. The grapes are a dark purple color when they are ready to harvest (which is typically in August). Concord grapes are very easy to grow; we will include a pruning diagram and planting instructions with your order. Small but delicious bright red cherries grow all along the branches of this decorative 8-foot high bush. In March, they are covered in snow-white blooms, but the best part comes in June, when the fruit ripens! The cherries are fairly small (blueberry-sized), with tiny pits. They are sweeter than pie cherries, but not as sweet as a Bing. It's best to plant two bush cherries (at least 6 feet apart, but not more than 50) for cross-polination and, therefore, higher yields. Egyptian Multiplier Onions $1.50/Head The head breaks apart, much like garlic, into 4 to 8 little bulblets that grow into perennial green onions. Harvest the greens year-round and chop into potato, tuna, or egg salad, or anywhere you would use "spring" onions. The onion bulb that grows underground is a small (walnut-sized) white onion that is quite peppery; just the thing for adding to homemade salsa. Super-easy to grow; complete planting and care instructions included. Ornamental Trees and Shrubs $5.00 each Butterfly Bush (your choice of purple or white), Hibiscus, Pyracantha (Firethorn), Rose of Sharon (your choice of purple or white), Corkscrew Willow, Zebra Grass (Miscanthus), American Boxwood, Viburnum, Nandina, Calycanthus (also known as Spicebush, Carolina Allspice, and Sweet Shrub), Acuba.